On April 2nd, the Canadian Franchise Association (CFA) brought our Franchise Awareness Day to the Legislative Assembly of Ontario in Queen’s Park, helping to raise awareness about Canada’s $100 billion (and growing) franchise industry. Over 20 leading CFA member franchisors connected with Ontario politicians to highlight the significance of the franchising industry and the positive impact it has made on the Canadian and Ontario economy. From Caucus meetings to one-on-one meetings to our cocktail reception, it was a day marked by connection, education, and empowerment. Together, our participating members were able to express the ongoing role franchising has played in their lives and Ontario’s local communities. Thank you to all our members who participated in Franchise Awareness Day and to the Members of Provincial Parliament (MPP’s) who took meetings with us. Scroll down to see some photos from the day! 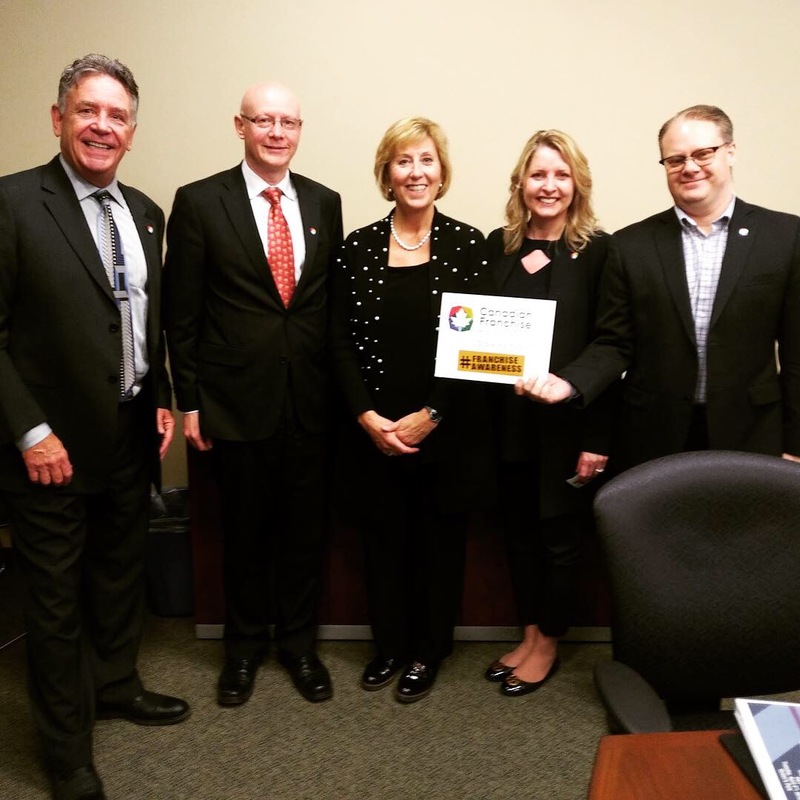 From left to right: David Collier (Prep ‘n Sell), Stephen Schober (Metal Supermarkets), Laurie Scott, Minister of Labour, Sherry McNeil (Canadian Franchise Association), and David Black (Canadian Franchise Association). From left to right: Todd Smith, Economic Development Minister, Sherry McNeil (Canadian Franchise Association), and Clark Harrop (McDonald’s Restaurants of Canada). 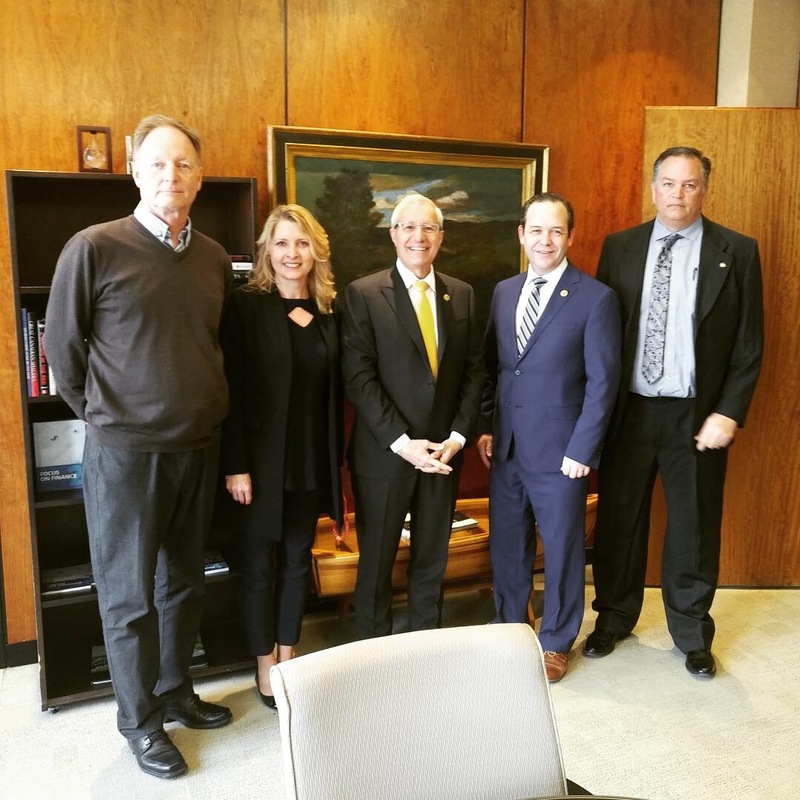 From left to right: David Black (Canadian Franchise Association), Jane McKenna, Parliamentary Assistance to the Minister of Labour, Sherry McNeil (Canadian Franchise Association), and David Druker (The UPS Store). From left to right: Chris Milthorpe (Fairhart Productions), Sherry McNeil (Canadian Franchise Association), Jeff Yurek, Minister of Transportation, Gary Prenevost (FranNet Canada), and Kenny Chan (Canadian Franchise Association). Ruthie Burd of The Lunch Lady and Michelle Burton, Qozen Yoga & Well-Being Studio. From left to right: Craig Touchie (Great Clips), Sherry McNeil (Canadian Franchise Association), Vic Fedeli, Ontario Finance Minister, Doug Downey, Parliamentary Assistant to the Minister of Finance, and Andrew Arminen (Metal Supermarkets). 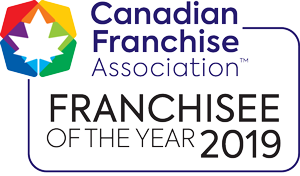 The Canadian Franchise Association (CFA) is pleased to announce the Traditional (those with bricks and mortar locations) and Non-Traditional Grand Prize (those that are mobile or home-based) winners of the 2019 CFA Awards of Excellence in Franchising are Inspiration Learning Center and Driverseat Inc., respectively. CFA awards two separate Grand Prizes to reflect the range of franchise opportunities on the market. “Franchising in Canada is very diverse, ranging from children’s education franchises like Inspiration Learning Center to home-based service franchises like Driverseat Inc.,” says Sherry McNeil, CFA President & CEO. To reflect this diversity, and to ensure participating franchise systems are being rated against their peers, the CFA Awards of Excellence in Franchising program includes seven categories and two Grand Prizes. Considered the pinnacle of franchise achievement in Canada, CFA Awards of Excellence in Franchising are given annually to franchise systems having demonstrated superior franchise relations, leadership, training and communications. The Grand Prizes were presented at the Awards Gala dinner during the 2019 CFA National Convention in Niagara Falls, Ontario. This year, over 70 CFA-member franchise brands participated in the CFA Awards of Excellence in Franchising program. Sponsored by CFA and administered by the Portage Group, a third-party research firm, the winning franchise systems were determined based on the results of a survey completed by participating brands’ franchisees about their experiences and levels of satisfaction with the system. Entries were separated into Traditional Franchises and Non-Traditional Franchises. Within these categories, entrants were grouped based on their number of franchisees. These categories reflect the diversity of franchising and the spectrum of franchise opportunities available in today’s market. New this year, CFA introduced the Franchisee of the Year Award recognizing top-performing franchisees for their unique accomplishments and excellence in business performance, community service, and brand involvement. Subway Restaurants’ multi-unit franchisee, Kelly-Anne Pelley from Corner Brook, Newfoundland and Labrador received the gold in the Traditional category and TWO MEN AND A TRUCK’s franchisees, Paul Bimm & Lyne Vincent from Ottawa, Ontariowere gold winners in the Non-Traditional category. Separated into Traditional and Non-Traditional Franchises, winners for the Franchisee of the Year Award were determined by CFA’s Education Advisory Committee based on the strength of the participating entrants’ award submissions. Traditional Franchises: Inspiration Learning Center | Non-Traditional Franchises: Driverseat Inc.
Gold: Pizza Nova Take Out Ltd.
For more information about the CFA Awards of Excellence in Franchising, visit www.awardsprogram.ca. The Canadian Franchise Association (CFA) helps everyday Canadians realize the dream of building their own business through the power of franchising. CFA advocates on issues that impact this dream on behalf of more than 750 corporate members and over 40,000 franchisees from many of Canada’s best-known and emerging franchise brands. 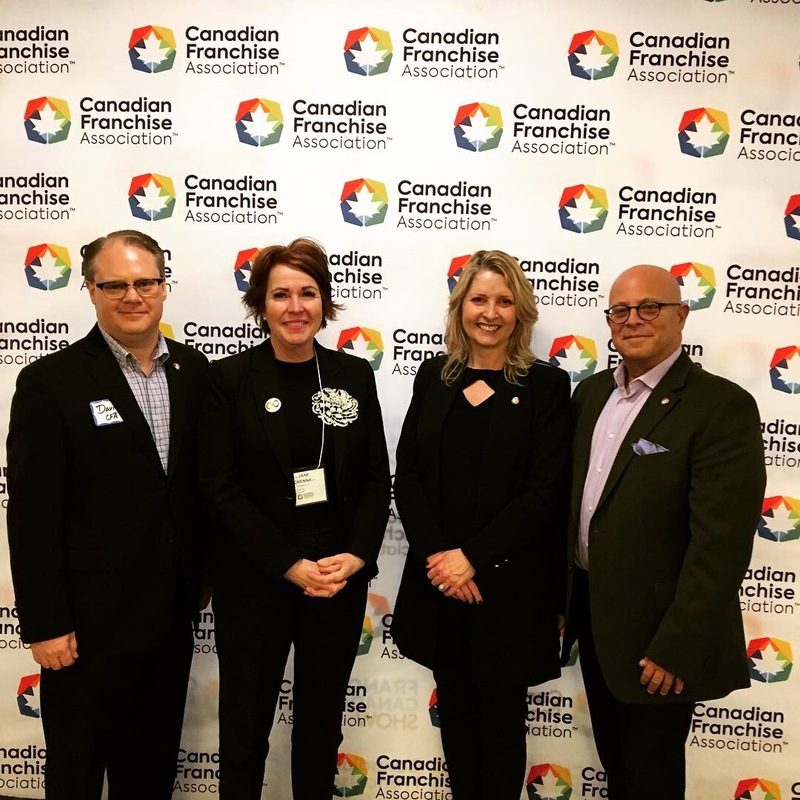 Beyond its role as the voice of the franchise industry, CFA strengthens and develops franchising by delivering best-practice education and creating rewarding connections between Canadians and the opportunities in franchising. Canadian franchises contribute over $100 billion per year to the Canadian economy and create jobs for more than 1.9 million Canadians. Learn more at www.cfa.ca or www.FranchiseCanada.online. 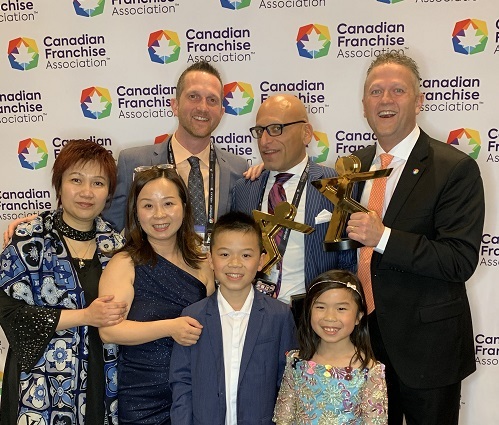 The Canadian Franchise Association (CFA) is pleased to announce the winners of the 2019 Recognition Awards! Honouring individuals and CFA member companies for their outstanding achievements, philanthropic endeavours, and contributions to the Canadian franchise community, these awards showcase those committed to enhancing franchising in Canada by Growing Together™. With the addition of the new Distinguished Franchise Support Services/Supplier Award, a total of six Recognition Awards will be handed out at the Awards Gala Presentation Dinner on Monday, April 8, during the 28th annual CFA National Convention in Niagara Falls, Ontario. Learn more about the winners below and register today for the CFA National Convention, April 7-9! For 25 years, Choice Hotels Canada has been one of the highest occupied franchised accommodation chains in Canada, with over 5 million guests staying at one of its 325 locations each year. Located in all provinces and over 80% of Canada’s largest communities, Choice Hotels is undoubtedly a valued asset for millions of Canadians, in large part because of its franchisees.100% franchise owned and operated, guests can expect great service, quality accommodation, and a consistent customer experience at any of the properties in Canada, as well as 6,900 Choice hotels in more than 40 countries. With some of the best known hotel brands in the nation, Choice Hotels Canada has left an indelible mark on the Canadian franchising industry. 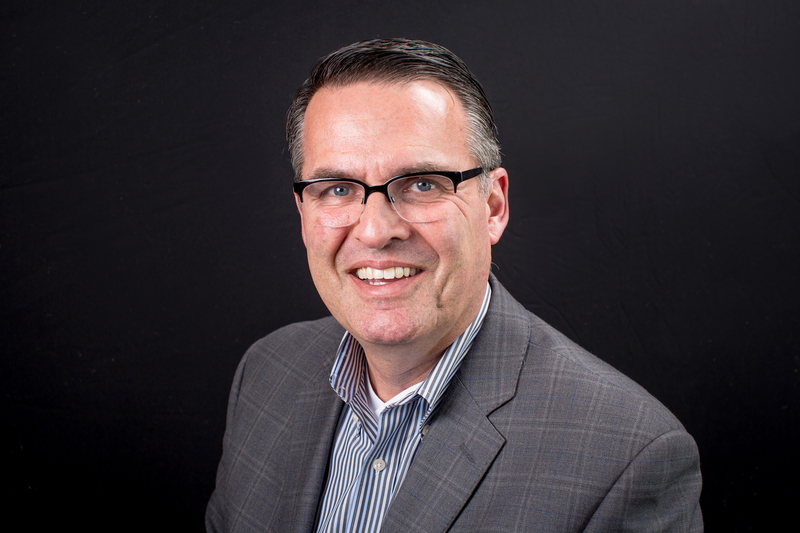 Since 2014, Tony O’Brien has been the Executive Vice President of TruShield Insurance, a role that is focused on developing insurance solutions that effectively allow Canadian entrepreneurs and small businesses to be successful and minimize risk. 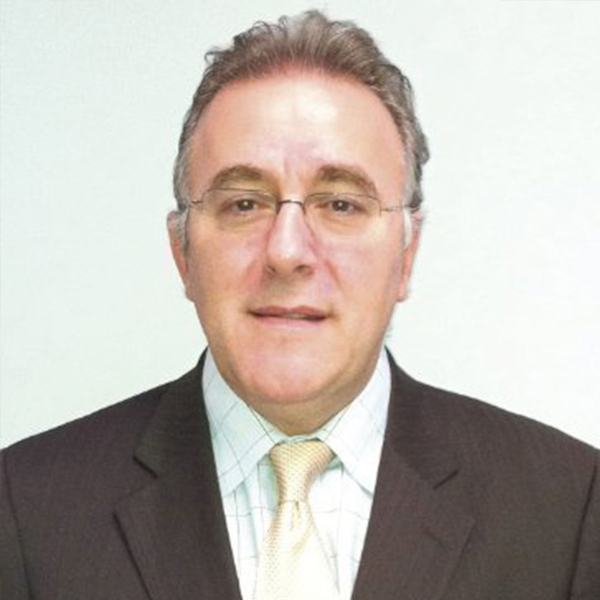 He is also the Chair of the Canadian Franchise Association’s Franchise Support Services and Supplier Committee. 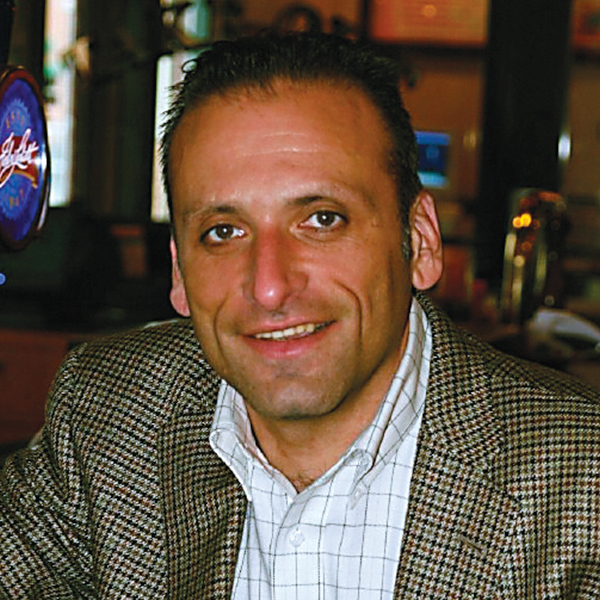 For years, Tony has dedicated his time and resources to advancing the franchising community. In fact, Tony has played a key role in numerous CFA events. 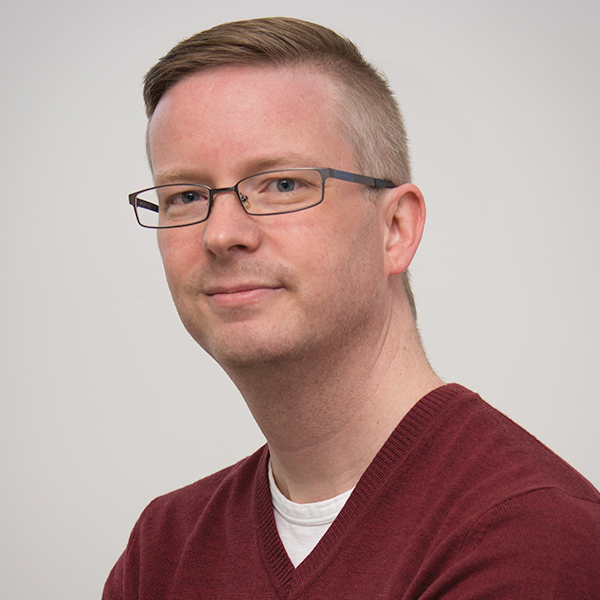 He’s also responsible for helping a range of professionals in the franchising industry, offering the best learning and training when possible. His deep involvement and continuous support of the franchise community has helped shape the CFA, and the franchising community at large. Pacini doesn’t just serve delectable Italian cuisine. For more than 30 years, this restaurant has served people. Operating under the belief in the collective power of individuals to make a difference in the community, Pacini developed a program called “Pour l’amour des gens” which means “For the love of the people.” Today, Pour l’amour des gens supports 25 organizations and has raised nearly $350,000 to benefit various initiatives. Through its commitment to prioritizing people, Pacini is doing more than just feeding mouths. Pacini is feeding the hearts, minds and souls of people across the country. One of the largest and fastest-growing tutoring centers in the Greater Toronto Area, Inspiration Learning Center, Tutoring and Private School is led by Director and Founder, Angel Kuang. A first-generation immigrant, Kuang is a fully-qualified educator who has fused both her Canadian and Chinese teaching experiences to not only help hundreds of students in diverse communities reach their full potential, but help entrepreneurs of all backgrounds (10 out of her 14 franchisees are women), who are passionate about education, achieve their dreams of success through franchising. The CFA’s ability to provide franchisors and franchisees premium educational and lead generation resources and support would not have been possible without Reshift Media’s outstanding contributions. For nearly seven years, this Canadian-based digital marketing company has worked closely with the CFA team to search optimize, redesign and market the CFA’s websites. Reshift is also an active member of the franchise community. You will often see the Reshift team at CFA events and they are very open about sharing their learnings and best practices with hundreds of other franchisors, franchisees and suppliers. For all these reasons, Reshift Media is recognized with our first-ever Distinguished Franchise Support Services/Supplier Award. Ron Joyce was the iconic Canadian entrepreneur who, in 1964, invested in the first Tim Hortons donut shop in Hamilton, Ontario and then grew the business into one of the most successful food service chains in the world. Soon after the passing of his business partner, Tim Horton, Ron Joyce founded the Tim Horton Children’s Foundation to support disadvantaged children and youth. 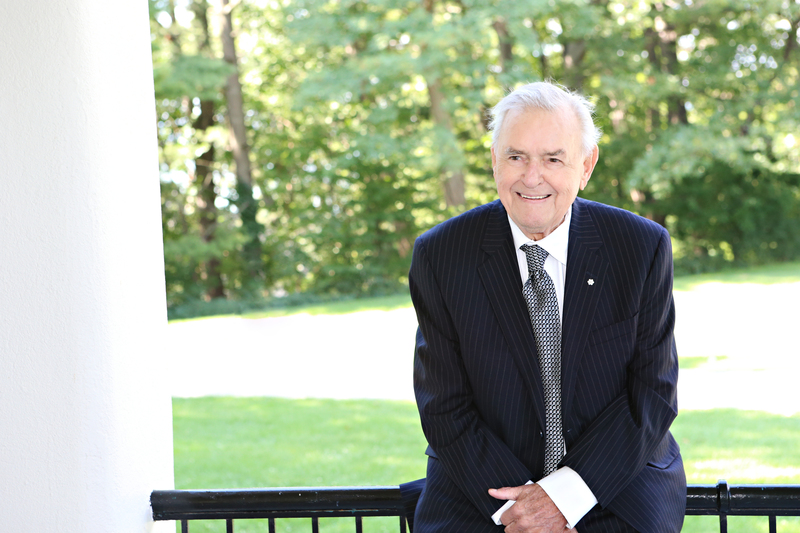 After selling his ownership of the company, he continued to personally support the well-being of children through his own foundation, The Joyce Family Foundation, which focuses on providing bursary funds to students looking to pursue a post-secondary education. Father, business owner and friend, Joyce’s spirit of generosity and unforgettable legacy will live on in the franchising community. The results are in and the Canadian Franchise Association (CFA) is excited to announce the finalists for the 2019 CFA Awards of Excellence in Franchising and first-ever Franchisee of the Year! Exclusively for CFA franchise system members, the Awards of Excellence is one of Canadian franchising’s biggest prize. Presented annually at the CFA’s National Convention, finalists are among a select few that have demonstrated the strongest and most mutually-beneficial relationships with their franchisees. Finalists are grouped into seven categories based on the type of franchise – either traditional (those who operate a brick and mortar location) or non-traditional (those who operate a mobile or home based business) – and the number of franchisees. The winners from each category will than go on to become finalists for our two Grand Prizes – one for traditional franchises and one for non-traditional franchises! Plus, for the first time this year, the CFA is excited to give out our Franchisee of the Year Award. Recognizing CFA member franchisees who have gone above and beyond for their franchise system, finalists have demonstrated excellence in business performance and community and brand involvement. Franchisee of the Year finalists are grouped into two categories: one for traditional franchises and one for non-traditional franchises. Check out the full Awards of Excellence and Franchisee of the Year finalists below and stay tuned for when the winners are announced on Monday, April 8, in Niagara Falls, Ontario! Pizza Nova Take Out Ltd.
Be the first to know who the winners are! Register today for the 2019 CFA National Convention, April 7-9 in Niagara Falls, Ontario! Plan Ahead – With so much to experience at the National Convention – including first-class educational sessions, keynotes, networking events and celebrations – planning out your three days is a must! Click here to access the agenda. 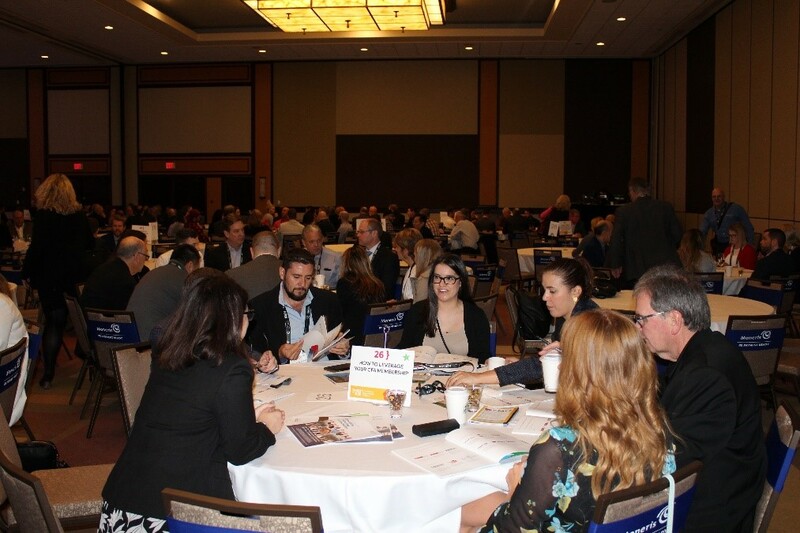 Build Strong Relationships – With over 500 attendees at the biggest event in franchising, this is the perfect time to cultivate new connections. Expert tip: Make sure you attend the social hub of the Convention, the Marketplace. Learn Something New – Don’t skip out on sessions just because you think you’ve mastered the information! Whether you’re brand new to franchising or you’re already established you can always learn something new. Growing Together – The beauty of the National Convention is that you’ve got plenty of opportunities to talk with like-minded peers. Lead by experienced facilitators, when you join one of the 25 roundtable discussions you’ll have the chance to hash out your big problems, discuss solutions and get the answers to your most pressing questions! Celeberate – Reaching your business goals is important but taking the time to celebrate is critical. Don’t miss the Gala Awards dinner where we’ll announce the winners of the Franchisee of the Year Award, Awards of Excellence, Recognition Awards and Franchisees’ Choice Designation, before heading over to the always- legendary After-Party. Make use of what you learned – Convention doesn’t end when it’s over. Take what you learned and apply it. Follow up with the connections that you’ve made to make the whole experience worthwhile! Opening a franchise requires a significant financial investment often including franchise fees and steep advertising costs. For some, who feel they may lack the financial assets to invest in a franchise, this can be quite daunting. But it doesn’t mean it’s the end of the road. Probably the easiest and most cost-effective way to fund your franchise is through personal savings. 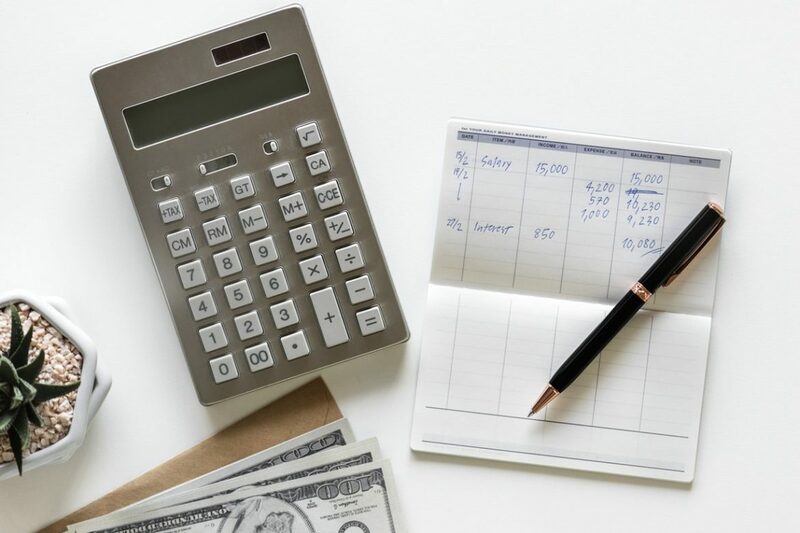 The advantages here are that you’ll know exactly how much money you have to put towards your franchise, you won’t have to pay back any interest on a loan, and you’ll retain complete control. Just be sure you have enough money saved to minimize the risks of personal bankruptcy or debt. One of the top reasons to go this route is that you’re likely to get a loan as part of a well-reputed franchise than as an entrepreneur starting a business from scratch. But, before you approach a bank for a loan, make sure your credit is in good standing, all the required paperwork (i.e. tax returns, personal financial statements), and a solid business plan in place. It doesn’t hurt to shop around and talk to different institutions about your financing needs. As a prospective franchisees, you are eligible for a number of government programs so long as you thoroughly understand and meet their qualifications. Keep in mind that the government loan application process can be long, which means it’s worth carefully considering your qualifications for a seamless approval process. Finally, you can always turn to family members and friends for funding. The benefit of this option is that you can agree on your own payment plan with family and friends. This is often a more flexible option, as sometimes you can adjust the plan if your financial situation changes. But ensure everything is in writing to avoid disagreements in the future. Remember to weigh the pros and cons of each financing method. 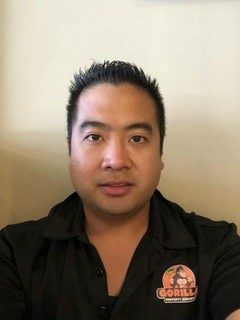 Find out which options Jon-Anthony Lui considered and used to fund his Tutor Doctor franchises on the Franchise Canada Chats Podcast. Fitness franchises have become extremely popular. In fact, franchise systems operating in the health and fitness sector have grown exponentially over the last five years. Over a five-year period, “Health and Fitness” franchise listings in Canada’s No. 1 franchise directory – Lookforafranchise.ca – have seen a 35 per cent increase. And it’s showing no signs of slowing down. 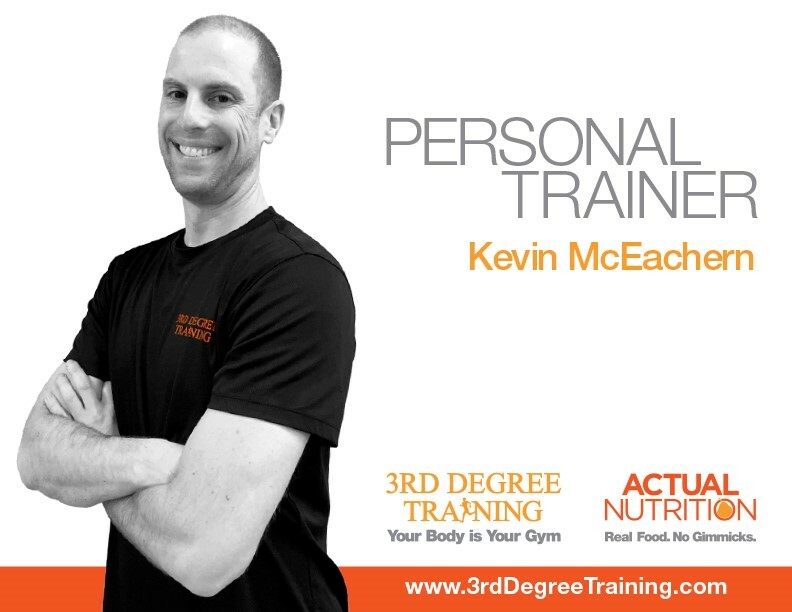 “Canadians today are taking charge of their health,” explains Steve Collette, co-founder and CEO of 3rd Degree Training and Actual Nutrition when asked why he believes health and fitness franchises are rapidly growing. He discusses the growth of this growing franchise category in detail on the Franchise Canada Chats Podcast! You can listen to it here. According to Stats Canada, more than 16.2 million Canadians aged 12 and over reported participating in at least 150 minutes of moderate to vigorous intensity aerobic physical activity per week. 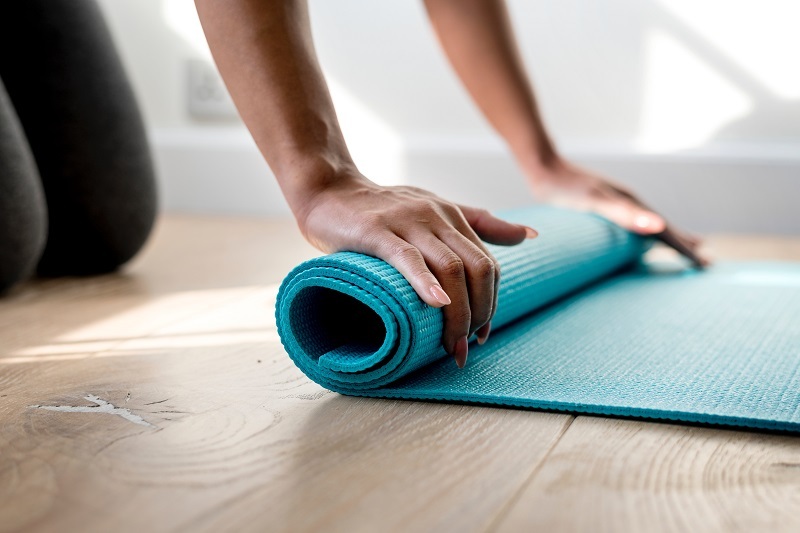 A health and fitness franchise not only actively meets this demand, but also provides its franchisee with the reward of helping Canadians live a healthy lifestyle and reach their fitness goals. Gone are the days when gyms targeted only a small segment of the population. Nowadays, gyms are attracting more members thanks to an abundance of choice. Members can choose a low-budget gym and still get a good sweat in or they could opt for a smaller, more specialized boutique studio to meet their specific fitness goals. Plus, there are 24-hour fitness centres popping up nationwide to make going to the gym is a lot more convenient for today’s consumers. More and more businesses are recognizing the benefits of a healthy workforce when it comes to the bottom line. Many employers are covering the costs of gym services and studios. This has become a great source of supplemental revenue for the fitness industry at large and it’s one of the reasons why this sector continues to thrive. Whether it’s on a bi-weekly or monthly basis, membership fees and/or annual contracts give entrepreneurs a source of recurring revenue. Combined with non-dues revenue sources typically available at gyms, such as smoothie bars and activewear merchandise, a health club could prove to be a very profitable venture. All these factors are the key reasons why the demand for fitness franchises is so strong. Losing no stamina anytime soon, it’s definitely an exciting time be in the health and fitness franchise business! You can learn more about the exciting opportunities in the health and fitness industry on the Franchise Canada Chats Podcast! Another year has come to an end and as we say good-bye to 2018 and hello to 2019, it’s time for you to follow your dreams, take a leap of faith, and pursue your personal and professional goals. If 2019 is the year you decide to invest in your dream franchise, the January/February issue of Franchise Canada is a must-read! 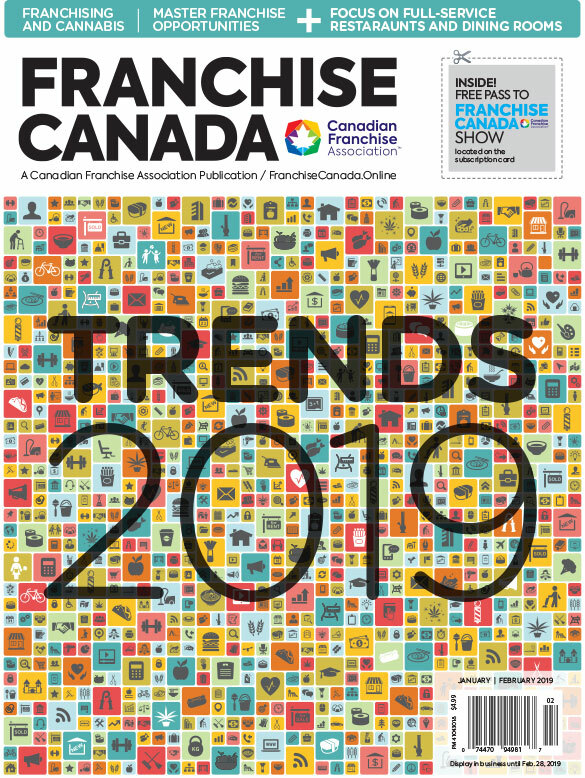 The Canadian Franchise Association’s (CFA) annual Trends Issue is officially online and on newsstands across the country, which means everything you need to know about the future of Canadian franchising is one click away. And if our 2019 Franchise Trends Report cover story is any indication, the year ahead looks bright for entrepreneurs, as 2019 is set to offer prospective franchisees a diverse range of exciting new investment opportunities. In our Trends Report, Franchise Canada breaks down the four franchise sectors that have experienced the most growth over the last five years, setting them up for success in 2019 and making them ideal investment opportunities for Canadians ready to be in business for themselves but not by themselves. Plus, our Trends Issue features not one, not two, but three Franchise Canada TV interviews with PropertyGuys.com, CleanQuip, and Spiritleaf. And that’s not all! Watch behind the scenes video content with Tutor Doctor franchisees as they explain why community involvement is vital for small business owners in our Giving Back feature. Click here to watch all videos from this issue. Military personnel and franchise owners have more in common than you think. Hear from three veterans of the Canadian Forces who share the core values that helped them succeed in both careers. The Cannabis Act now means Canadians can legally possess, consume, and grow recreational cannabis. Take a look at three cannabis-based franchise systems looking to grow through franchising. Are you ready to become a best-in-class franchisee? Get an exclusive look at the top 10 traits of the most successful franchise partners and learn how you can stand out from the competition. What two franchises are making a name for themselves online? Bloomtools Canada and WSI Digital are pioneering new age concepts, one click at a time. You can start reading the January/February issue of Franchise Canada online now. So, get your reading glasses on and get ready to learn about the best investment opportunities available to you in 2019! 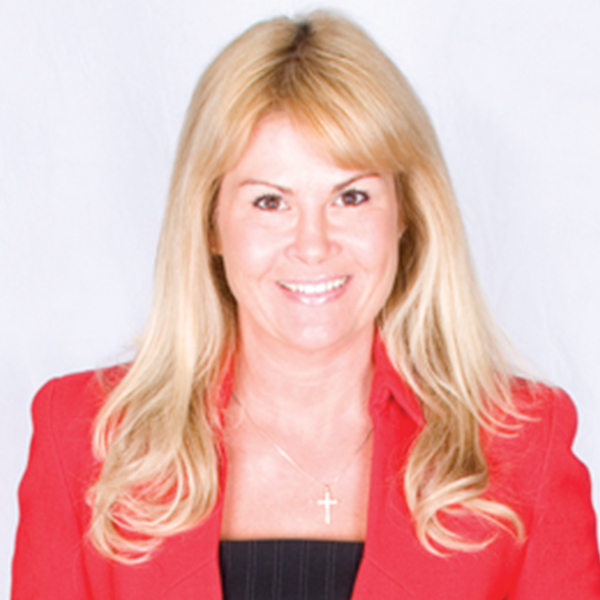 If you want an honest opinion about the benefits of the Canadian Franchise Association’s (CFA) Zor-2-Zor: Franchise Coach in Your Corner mentoring program, just ask Lice Squad.com Founder, Dawn Mucci. The franchisor of the Canadian lice removal franchise has a unique experience with the program seeing that she has participated as both a mentee and a mentor. 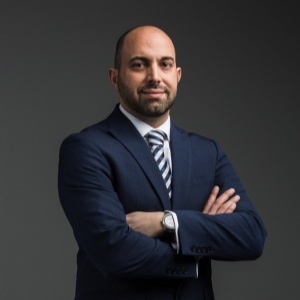 “Participating in the program first as a mentee and then as a mentor has provided me with a wealth of valuable education and has allowed me to give back to an industry I am passionate about,” Mucci says. The free, volunteer-driven service pairs new CFA members with established franchisors within the Association. New franchisors looking to grow their business and find long-term success receive first-hand guidance and support from some of the franchise industry’s most successful leaders. For their part, mentors have an opportunity to “pay-it-forward” by sharing knowledge to those new to the industry, helping to promote franchise excellence in the process. Both mentees and mentors expand their network by connecting with other franchise professionals, gain new ideas and insights by discussing experiences and challenges with one another, and help to strengthen the franchise industry by sharing and learning best practices. Today, with over 25 franchise units, Lice Squad.com is expanding across the country and Dawn Mucci can give some credit to Zor-2-Zor for helping her learn more about the industry. CFA’s Zor-2-Zor: Franchise Coach in Your Corner is a free program that pairs new or emerging CFA members with established members for one-on-one coaching. Click here to find out how you can sign up as a mentor or mentee or complete the form below to receive more information. By submitting this form, you are providing your consent for a CFA staff member to contact you by phone and/or e-mail regarding CFA's mentor program. From where small business owner Utesh Charan is standing, the future of franchising looks bright. On a typical day, the Gorilla Property Services franchisee can be found outside in the sun, tackling some of the biggest property maintenance tasks around. For someone used to working inside, working outdoors is definitely a perk that brightens Charan’s day. But even when the weather is less than optimal, Charan never backs down from the chance to also brighten the day of his customers. In sun, rain or snow, he can be counted on to show up and take care of his clients’ property management needs. From the moment the beloved “monkey” truck powers down the street, clients know they’ll receive the highest quality of care, whether that’s in pressure washing, gutter cleaning, or roof cleaning services. And franchisees, like Charan, are not only proud of consistently delivering those kinds of services, but are grateful for the financial security that comes along with being part of a reputable franchise system. Sometimes all you need to propel yourself into success is the right franchise opportunity. And it often begins with leveraging the right kinds of tools. Tools like Canada’s number one online directory – lookforafranchise.ca. Fast forward one year later and Charan is still appreciative of his decision to search for a franchise using the CFA online directory. He gets to be part of Gorilla Property Services – an opportunity that generates profits with the added bonus of the independence and support he’s longed for. You could say the latest issue of Franchise Canada is award-worthy! Our annual Franchising Excellence issue is now available online and on newsstands across the country and with an exclusive look at this year’s Awards of Excellence winners, it’s one you don’t want to miss. We’re giving you a rundown of the strongest brands in the industry from the CFA’s 2018 Grand Prize winners to this year’s Franchisees’ Choice Designees. And the celebration doesn’t stop there! 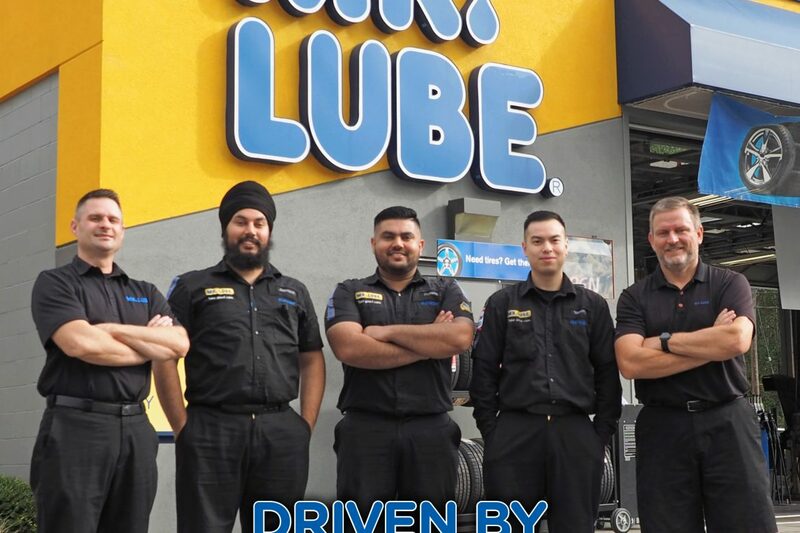 Our cover story on Mr. Lube honours the Canadians brands’ 2018 Franchisees of the Year. Find out what Rick Spindor and Keith Wickens have to say about winning the coveted award and get tips on how you can be next year’s Franchisee of the Year. And new to this issue, we’ve launched Franchise Canada TV. Get behind the scenes franchising content with exclusive interviews featured in Franchise Canada Magazine. In our first episode, we speak with Peter Rakovalis, Mr. Lube’s Director of Franchise Development. Watch the interview below and read the entire cover story here. Discover which systems are doing their part to help the community with a business model focused on senior and homecare services. Determination and passion are just two qualities any prospective franchisee should have before taking the leap into business ownership. Here, we break down the top 10 traits any best-in-class franchisee should bring with them on the job. Get the facts on the Canadian QSR sector, featuring Fatburger, Pizza Pizza, Mr. Greek and more! The latest issue of Franchise Canada is available online now. So, roll out the red carpet, get ready to celebrate franchising in 2018 and be inspired to achieve entrepreneurial success! In 2018, Little Kickers won the CFA’s Awards of Excellence Grand Prize for non-traditional franchise system. Awarded once a year, the Grand Prize recognizes franchise systems with strong, mutually beneficial relationships with their franchisees. Watch our exclusive interview with Little Kickers Canada CEO, Frank Stanschus, to get his thoughts on winning the award, why it’s critical to provide comprehensive training and support to franchisees, and what he would tell franchisors who want to improve their franchisee relationships. Click here to read our full Q&A! Immerse yourself in one of Canada’s largest and fastest growing industries in the September/October 2018 issue of Franchise Canada. Now available for free online and on newsstands across the country, our annual Food Issue is the perfect read for any prospective franchisee who loves to dine. From quick service and fast casual to full service restaurants, we have everything you need to know about the food industry including an in-depth guide on the various food-related franchise models you can invest in. Of course, before investing in a franchise you have to do your due diligence. Find out what you need to take into account before entering the food sector with tips from franchise consultant Gary Prenevost and other experts in the field including, Shoeless Joe’s President Frank Lopreiato, and Grinner’s Food Systems Vice-President of Franchising and Development, Guy Gallant. Excellence in Franchising: Celebrate the 2018 Awards of Excellence Grand Prize winners, Little Kickers and Symposium Café. Find out why fostering franchisee relationships is key for these systems and how it led to their franchise success. Ultimate Guide to Buying a Franchise: Start your franchise search with our informative introduction to the franchising world. Learn franchise basics and have your most pressing questions answered. Visit FranchiseCanada.Online to read the latest articles from the September/October issue today! 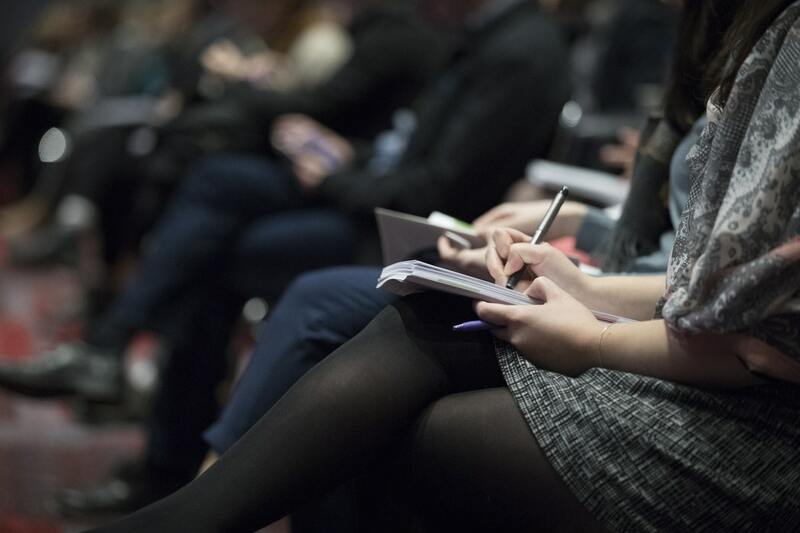 The Canadian Franchise Association’s (CFA) renowned Franchise Your Business seminar returns this fall, making stops in Montreal, Toronto and Vancouver! Designed to help you expand your business using the franchise business model, the Franchise Your Business seminar is a must-attend event for any entrepreneur looking for long-term success. 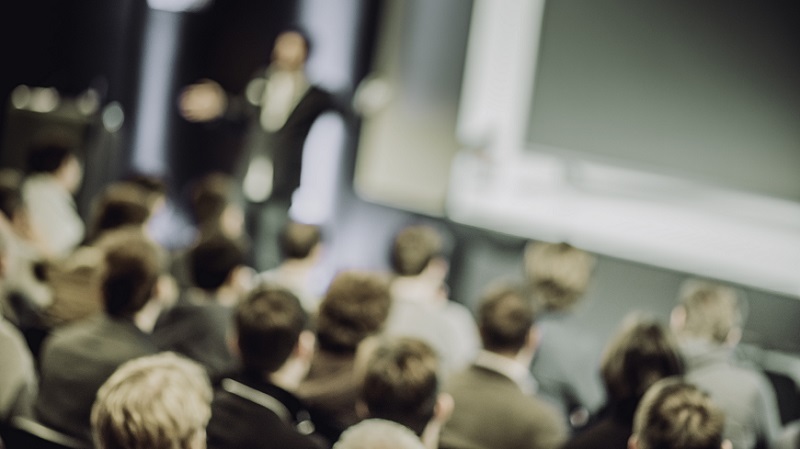 So, how do you know if you should attend a seminar? Read on for the answer and register for a seminar in a city near you! The Franchise Your Business seminar isn’t just for established business owners. If you have a great idea and want to learn more about what next steps you should take, we’ve got you covered! Seminar speakers include consultants, lawyers, financial representatives, and experienced franchisors, all equipped with the information you’ll need to turn your idea into a reality. If you’ve recently started franchising your business but are still looking for efficient and long-term growth strategies, the Franchise Your Business seminar is where you need to be. We’ll teach you franchising fundamentals, including how to structure a franchise deal, establish creative marketing tactics to attract quality franchisees, determine your franchise fees and investment costs, and more! With an established and successful business already in place, there’s no better time than now to expand across the country and abroad! Franchising is a viable option for entrepreneurs looking to grow efficiently and cost-effectively. After attending this seminar, you’ll know if your business can be franchised, get first-hand advice from experienced franchisors who have seen it all, and learn how you can avoid potential pitfalls. Even if you’re not ready to grow your business just yet, attending the Franchise Your Business seminar is the first step you should take as you plan future expansion. Our speakers are pros in their fields and networking with them will come in handy when you do decide to make the leap into franchising. Unable to attend a live seminar? The valuable content from our Franchise Your Business seminars is now available on-demand so you can learn how to franchise your business at any time! Click here to register. Le reconnu séminaire Franchisez votre entreprise de l’Association canadienne de la franchise (ACF) revient cet automne, s’arrêtant à Montréal, Toronto et Vancouver! Conçu afin d’aider l’expansion de votre entreprise grâce au modèle d’affaires de la franchise, le séminaire Franchisez votre entreprise est un événement incontournable pour tout entrepreneur recherchant le succès à long terme! Donc, comment savez-vous si vous devez participer au séminaire? Lisez la réponse ci-dessous et enregistrez-vous pour un séminaire dans une ville près de chez vous! Le séminaire Franchisez votre entreprise n’est pas seulement pour les propriétaires d’entreprises établies. Si vous avez une belle idée et désirez en savoir plus sur les prochaines étapes à prendre, nous avons ce qu’il faut! Les conférenciers au séminaire comprennent des consultants, des avocats, des représentants financiers et des franchiseurs expérimentés. Ils sont tous équipés de l’information nécessaire afin de transformer votre idée en une réalité. Si vous avez récemment commencé à franchiser votre entreprise mais recherchez toujours des stratégies de croissance efficaces et à long terme, le séminaire Franchisez votre entreprise est où vous devez être. Nous vous enseignerons concernant les notions de base du franchisage, y compris comment structurer une offre de franchise, établir des tactiques créatives de marketing afin d’attirer des franchisés de qualité, déterminer vos frais de franchise et coûts d’investissement et plus encore! Avec une entreprise établie et ayant du succès déjà en place, c’est le temps ou jamais de la faire croître à travers le pays et à l’étranger! Le franchisage est une option viable pour les entrepreneurs recherchant une croissance efficace et rentable. Après participation à ce séminaire, vous saurez si votre entreprise peut être franchisée, vous recevrez des conseils pratiques de franchiseurs expérimentés qui ont déjà passé par là, et vous apprendrez comment éviter les embûches potentielles. Même si vous n’êtes pas toujours prêt faire croître votre entreprise pour le moment, participer au séminaire Franchisez votre entreprise est la première étape à prendre alors que vous planifiez l’expansion future. Nos conférenciers sont des professionnels dans leurs champs de travail et faire du réseautage avec eux deviendra pratique lorsque vous décidez de faire le saut dans le monde du franchisage. Incapable de participer à un séminaire en personne? Le contenu de valeur de nos séminaires Franchisez votre entreprise est à présent disponible sur demande. Vous pouvez donc apprendre comment franchiser votre entreprise en tout moment! Cliquez ici pour plus d’informations. Sometimes the road to franchise success is long and winding. But for many, like Gorilla Property Services franchisee, Pascal Quindipan, even with a few bumps along the way, in the end it’s all worth it. And that wasn’t always the case. But as any startup owner will tell you, launching a business from scratch is fraught with risk. And no one knows this better than Pascal. Just three years after opening the business he spent a considerable amount of time building, it all crumbled, taking down his dream of business ownership with it too. For all intents and purposes, his move into business ownership seemed like a setback, a move in the wrong direction. Until, that is, he attended the CFA’s Franchise Canada show. Passion refueled, dream reignited, he set off for the Franchise Canada show in Vancouver, but this time he decided not to go it alone. With a ticket to Canada’s most credible franchise exhibition in hand, Pascal wanted to start a business for himself but by no means by himself. It was the turning point for Pascal; just three months later, he successfully achieved his dream of business ownership. Celebrating a hard-earned milestone, a year has passed since Pascal found success as a Gorilla Property Services franchisee. 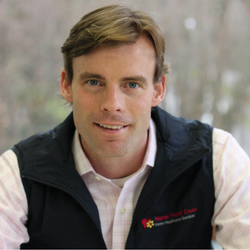 Now a typical day for the Richmond native can include anything from driving to a new site, working on a client’s property (while enjoying the beautiful weather), or managing a team of eager trainees. It’s a business he couldn’t be happier to be a part of not only because it’s low-cost compared to other franchise investments but because he can benefit from being part of a system and drop off any mental baggage that comes with starting a business at the door. Today, Pascal not only gets to be his own boss, he gets the freedom to be with the ones he loves the most. And while the journey was by no means easy, it’s clear that franchising can provide a path to success that, in the end, makes it all worth it. Malika Rezgani was working in a medical office in downtown Toronto when she decided to do some light reading during one of her downtimes. A rehab support worker at the time, Rezgani always dreamed of opening her own business via franchising, but with her busy schedule, could never find the right time to explore the opportunities available to her. As fate would have it, the clinic where Rezgani worked subscribed to Franchise Canada. “For me, starting my franchising career began by simply picking up the magazine and reading it,” she reflects. Though franchising was always at the back of her mind, Rezgani’s interest in the business model resurfaced after reading an article on Lice Squad.com Founder & CEO, Dawn Mucci. Mucci founded Lice Squad.com in 2001 after she recognized a growing number of concerned parents were in search of safe and chemical-free solutions to remove their children’s head lice. Today, Lice Squad.com clinics can be found across the country, offering families natural and eco-friendly removal products and services. Promising a stress free – and even fun – experience, Lice Squad.com consultants and franchisees do more than remove the pesky bugs. Education is a key aspect of the business, as Mucci and her franchise partners have made it a priority to equip clients and the public with removal and prevention knowledge. Rezgani was immediately impressed with the unique business model and its projected growth. More importantly, she knew a career with the franchise would be a perfect fit with her personal and professional qualities. 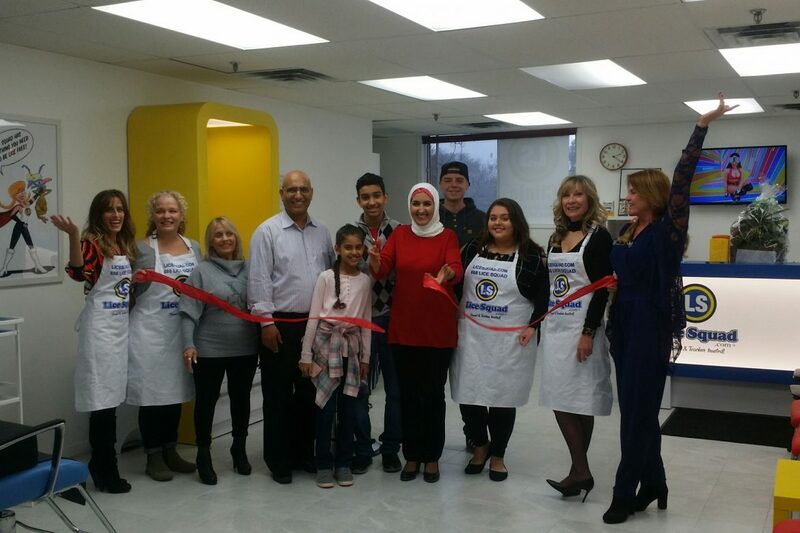 Today, Rezgani is a multi-unit franchisee with Lice Squad.com, having opened her first clinic in February 2017 covering the Hamilton and Burlington, Ontario regions. Only a few months later, her second location opened in Niagara. Rezgani’s life as a small business owner has given her the freedom to manage her career independently while continuing her passion for working with people. And she says she can thank her on-a-whim decision to pick up Franchise Canada for all of it. For more information about all of our Franchise Canada advertising opportunities, contact Gwen Dunant at gwen@cfa.ca/1-877-254-0097, or click here to learn more! Now that the election dust has settled, you may have a new Member of Provincial Parliament (MPP) representing your riding. This is a critical time to start building relationships with those who represent your voice! Unfortunately, many MPPs and members of government are still unaware of the complexities of the franchise industry. Meetings go a long way to help paint a picture of the everyday franchise owner. Meeting with MPPs is one of the most critical advocacy activities available and can be a very powerful tool. It gives you an opportunity to connect with them directly and share real-life experiences of what owning a business and creating jobs means to you, your family and your community. Inviting your MPP to visit your business will make the meeting that much more personal and memorable; creating the opportunity for them to meet your staff and understand the dynamics of your everyday life as a small business owner. Bringing a personal aspect to the relationship could make your MPP more likely to act on your behalf. MPPs are interested in hearing from constituents and those actively involved in the community. By taking the time to meet with your local MPP, you’re demonstrating that franchisors and franchise owners are active members of the community who care to take the time to develop that relationship. This benefits not only yourself, but the community in which your business resides, and the franchising community as a whole. Why did you choose the franchise model? How many people does your franchise system employ? What are the benefits of working for a franchisee within your brand? Download CFA’s ‘Franchising in Ontario: Policy Briefing’ for more helpful information. For help finding your MPP’s contact information or booking a meeting, contact David Black, Director, Government Relations & Public Relations at dblack@cfa.ca or call 1-800-665-4232 ext. 297..
Any good businessperson knows that networking is a key ingredient for success. Whether it’s forming partnerships with influential entrepreneurs, spreading your brand to target audiences, or learning effective business strategies from experts in the field, networking serves many purposes within the world of franchising. Fortunately for you, the CFA’s upcoming Golf Tournaments are designed to connect you with franchise leaders across the country! Join us at one of three Golf Classics in BC, Ontario, and New Brunswick this June and come prepared with these hot networking tips. Be On Time: Being late never looks good and never goes unnoticed. Show your reliability by arriving on time (registration opens at 9:00 for the Atlantic Golf Classic and 10:00 for the Pacific and Central Classics) and come early if you plan on meeting franchisees or clients. Don’t Start The Day Talking Business: The Golf Classic is meant to be a fun, stress-free day in support of the CFA’s advocacy work! Acknowledge when business talk is and isn’t appropriate. Put Your Guests First: If you’re inviting employees or clients, ask them what activities they want to participate in, and play to their comfort level. In addition to golf, additional sports and spa options are available at our Central Golf Classic. Stay Engaged And Listen: It’s not all about you! Although you may be eager to talk about your business, make sure you listen to what others are offering. Engage, ask questions, and determine which systems would make for an ideal partnership. Research: If you want to connect with a specific individual or franchise system, come prepared with questions you want to ask, and make sure you know their business inside and out. Trust us, they’ll be impressed! Articulate Your Goals: Understand your business goals and be prepared to speak about where you are, where you’re headed, and what you hope to achieve in the future. For sponsorship opportunities, please contact Lou Gervasi, Events Manager, at lgervasi@cfa.ca or 416-695-2896 Ext. 243. 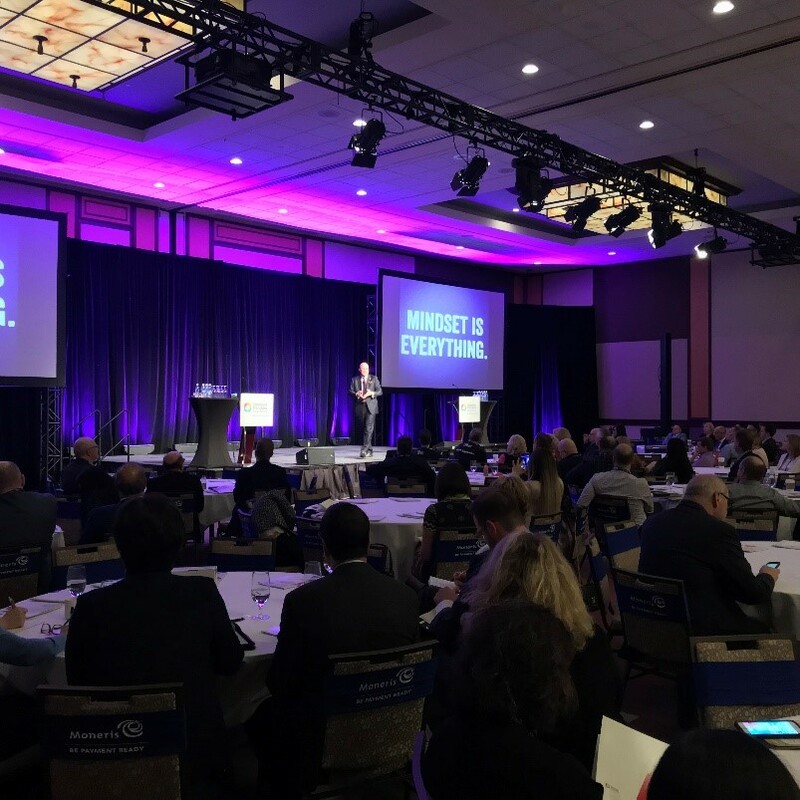 From April 22-24, the Canadian Franchise Association (CFA) welcomed franchise experts, inspirational keynote speakers, new and emerging franchisors, and hundreds of delegates from across the country as we hosted our 27th annual National Convention in Ottawa, Ontario! Held at the Westin in the heart of the nation’s capital, this year’s festivities brought together the best of the best in Canadian franchising for three days of non-stop networking events, educational learning opportunities, and engaging presentations covering a range of pertinent franchise topics. Day 1 kicked off with a special FSS/Supplier Forum hosted by TruShield Insurance’s Tony O’Brien. Along with an expert panel, O’Brien shared with franchise suppliers and support services providers how they can maximize the benefits of their CFA membership and network with top franchisors to achieve their business goals. Next up was our high-demand Power Sessions where world-class franchise experts shared insightful knowledge on sales, marketing, business development, and management. It was a full house later in the afternoon for the Essential Legal Update. Moderated by a panel of some of Canada’s leading lawyers, franchisors learned about the latest legislative updates in Canada, how these changes could impact their businesses moving forward, and what they could do to mitigate potential challenges. New CFA members and first time Convention delegates were then treated to a special networking cocktail reception before learning more about the new CFA branding, purpose, and mission statement. The CFA’s Chair of the Board of Directors, John Wissent, and the 1st Vice Chair of the Board of Directors, John DeHart, were on deck to share with delegates the CFA’s new brand, created in partnership with the CFA Branding Committee and branding agency, Pigeon Brands. The exciting unveiling was followed by the first Keynote Presentation of the Convention. Charlwood Pacific Group’s CEO & Chairman, U. Gary Charlwood, shared with delegates the inspiring story of how he worked his way up the corporate ladder before purchasing and growing Century 21 into one of Canada’s largest and most respected real estate organizations. The day ended with an informative presentation by the CFA’s Vice President of Government Relations & Public Policy, Ryan Eickmeier, and President & CEO, Lorraine McLachlan, on the release of the much-anticipated Economic Impact Study, followed by the Marketplace Opening Reception. Open throughout Convention, Marketplace exhibitors got to showcase their innovative franchise-related products and services with franchisors. Sales expert Todd Cohen got the crowd laughing bright and early Monday morning with his engaging Keynote Presentation on how to build a sales culture in your organization. 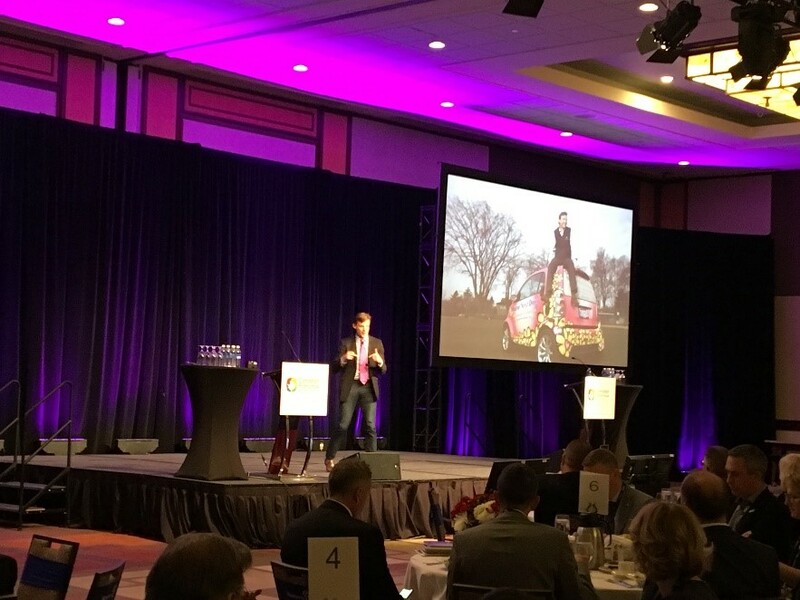 Using relatable anecdotes, Cohen used his own business experiences to keep delegates engaged and drive home the point that creating a “sales” culture is a must to find business success. Click here for a special thank you message from Todd! There were non-stop learning opportunities throughout the remainder of the afternoon as Roundtable Discussions, Concurrent Sessions, and a special Closed-Door CEO Session with Todd Cohen took place. Moderated by franchise experts from CFA’s membership, these sessions were a great way for delegates to learn more about a specialized topic, discuss challenges and opportunities they face in their businesses, and develop effective and efficient solutions with one another. The day ended with the most anticipated event of Convention…the Gala Awards Presentation Dinner! 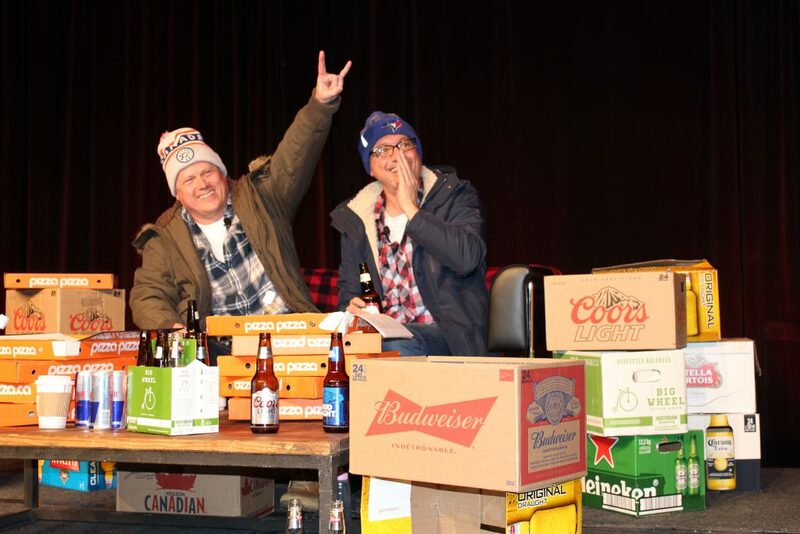 Co-hosted by PropertyGuys.com’s Ken LeBlanc and Walter Melanson – who channeled Bob and Doug McKenzie from the “Great White North” – the night was filled with laughs and Canadian-themed jokes as attendees became true hosers for the evening. In-between the on-stage entertainment, franchising excellence was celebrated with the presentation of the 2018 Franchisees’ Choice Designation, Recognition Awards, and Awards of Excellence in Franchising. Kumon Math and Reading Centres received the Hall of Fame Award in recognition of their outstanding business performance and unwavering commitment to educating children across the world. The CFA’s Changing Workplaces Taskforce took home the Volunteer Leadership Excellence Award, while the Outstanding Corporate Citizen Award was presented to BioPed Footcare Centres for their work helping underprivileged communities through the Goodytwoshoes Foundation. Former President & CEO of Mister Transmission, Randy Moore, took home the Lifetime Achievement Award for his 40-year career with the automotive franchise, while Ruthie Burd, founder of The Lunch Lady, took home the first-ever Diversity and Inclusion Champion Award. Next up, excellence in Canadian franchising was celebrated as Wise Cracks, Lice Squad.com, Little Kickers, Symposium Café, Paul Davis Restoration, Triple O’s, and Pizza Nova took home Gold in their respective categories. Lorraine McLachlan took to the stage to present two of the Gold finalists with the coveted Grand Prize for Traditional and Non-Traditional Franchise Systems. For the second straight year, Symposium Café took home the Grand Prize for Traditional Franchise System, while Little Kickers won big for Non-Traditional Franchise System! The night wasn’t finished yet though, as the celebration continued at Lowertown Brewery in the ByWard Market for the After-Party. The final day of Convention started with a buffet breakfast in the Marketplace followed by more Roundtable Discussions, Concurrent Sessions, and a Closed-Door CEO Session with Nurse Next Door and LIVE WELL Exercise Clinic co-founder, John DeHart. DeHart was on stage later in the morning for the final Keynote Presentation where he shared with delegates how they could build a hyper growth brand from the inside out by developing a positive work culture. 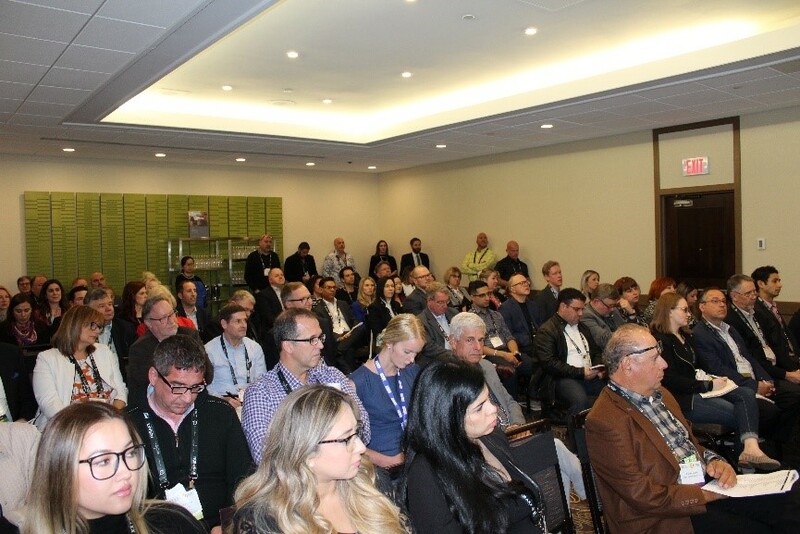 The closing luncheon immediately followed the Keynote Presentation, followed by Franchise Awareness Day, where a group of Convention delegates headed over to Parliament Hill for a full day of meetings with Members of Parliament. Thank you to all attendees, presenters, exhibitors, and sponsors for making this year’s Convention one to remember. We’ll see you next April in Niagara Falls! Put your winter parkas in storage and get ready for the summer with the Beauty, Health & Wellness issue of Franchise Canada! Now available online and on newsstands across the country, the May/June issue is equipped with the franchise knowledge you to need to successfully start your career in the nutrition, fitness and health industries. You can make this summer one to remember by investing in your dream franchise! The latest issue of Franchise Canada not only showcases the most exciting opportunities expanding across the country, we’re giving readers an inside look at what it takes to become a franchisee in our Ultimate Guide to Buying a Franchise in Canada feature! The Heart of a Successful Franchise: Delve into the world of Orangetheory Fitness and see how this up and coming franchise is using its revolutionary workout regimes to recruit franchisees around the globe! Eye of the Beholder: Beauty salons are in high demand and popping up across the country. Take a look at four beauty franchises that have found their niche market and are using the franchise business model to partner with entrepreneurs as passionate about beauty as they are! Picture of Good Health: Getting in shape means more than just breaking a sweat. In our Picture of Good Health feature, we showcase four food franchises offering Canadians flavourful and nutritional meal options including meat replacement proteins, plant-based menus, healthy beverages, and more! Aging Gracefully: The home and senior care industry is more popular than ever and will continue to grow as Baby Boomers reach the age of 65. In our Aging Gracefully feature we take readers on a journey of five unique senior-focused systems helping Canadians from coast to coast. If you’re a gym junkie looking to turn your passion into a successful career, get your hands on Franchise Canada today! Visit Franchise Canada Magazine online to read articles from the May/June 2018 issue for free. Franchise Canada is now available on Issuu! Subscribe now and get six full digital issues of Franchise Canada, plus a FREE print subscription delivered right to your door for just $29.99. Click here to subscribe now! 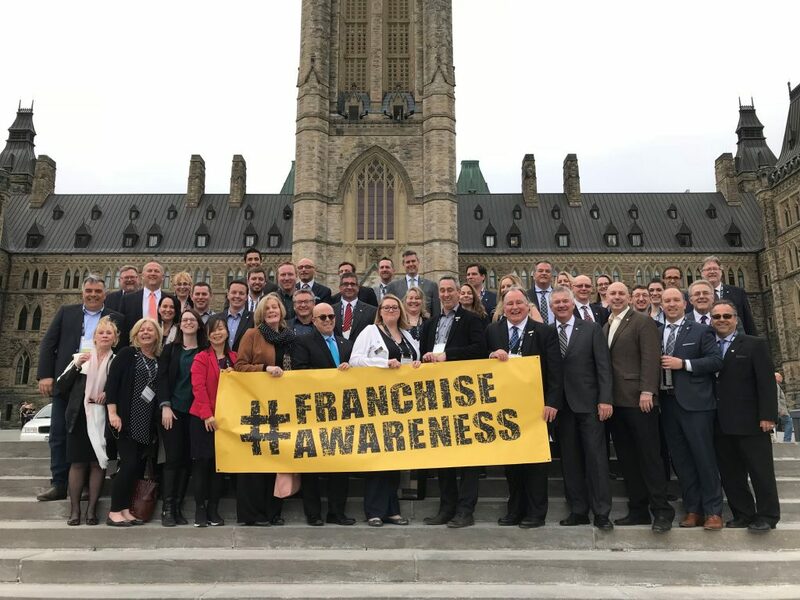 TORONTO – April 25, 2018 – Yesterday, the Canadian Franchise Association (CFA) convened on Parliament Hill to raise awareness about Canada’s $96 billion franchise industry during Franchise Awareness Day. Armed with the latest numbers from the CFA’s Economic Impact Report, more than 75 franchise business leaders from across Canada met with politicians throughout the day to educate them about the franchise sector’s significant contribution to the Canadian economy and job creation. The first of its kind in Canada, the Economic Impact Report was published by the CFA in partnership with the Canadian Centre for Economic Analysis (CANCEA), a leading economic research organization. Beyond the numbers, participating franchisors and franchisees also shared their own personal stories of how franchising empowered them to go into business for themselves, but not by themselves. To learn more about franchising in Canada, and to download a free preview of the Economic Impact Report, visit cfa.ca/research. The Canadian Franchise Association (CFA) helps everyday Canadians realize the dream of building their own business through the power of franchising. CFA advocates on issues that impact this dream on behalf of more than 700 corporate members and over 40,000 franchisees from many of Canada’s best-known and emerging franchise brands. 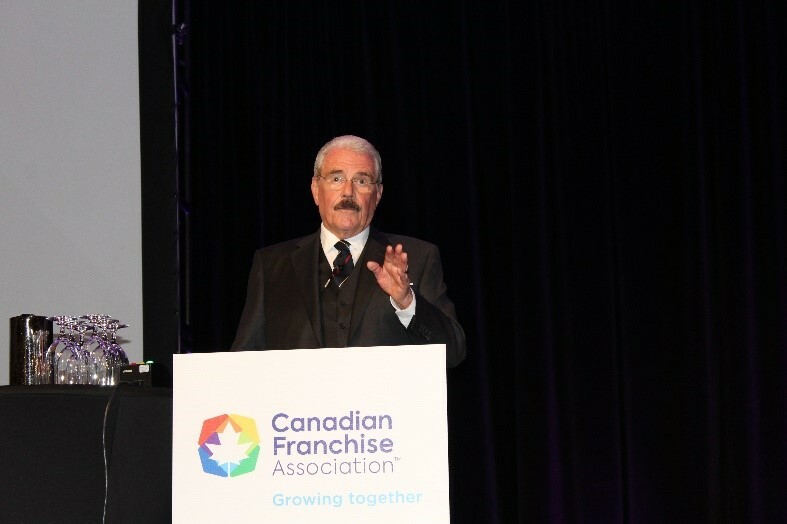 Beyond its role as the voice of the franchise industry, CFA strengthens and develops franchising by delivering best-practice education and creating rewarding connections between Canadians and the opportunities in franchising. Canadian franchises contribute over $96 billion per year to the Canadian economy and create jobs for more than 1.8 million Canadians. Learn more at www.cfa.ca or www.FranchiseCanada.online. 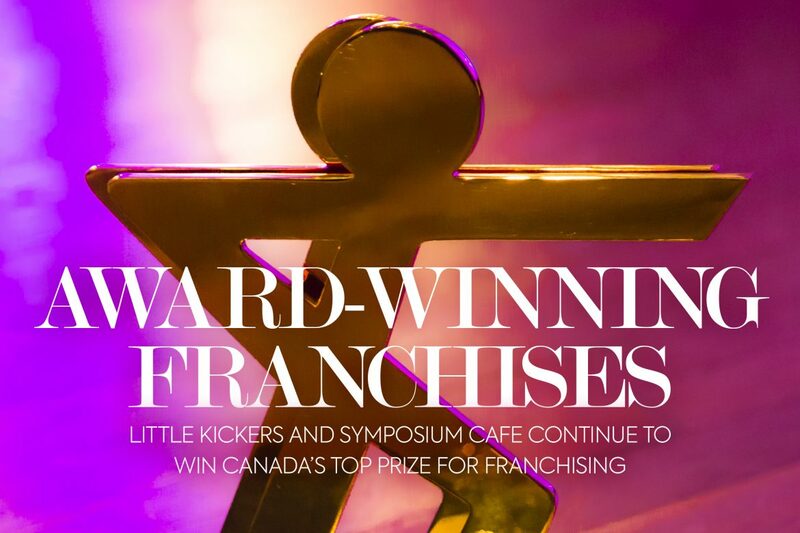 (Toronto, ON) April 24, 2018… The Canadian Franchise Association (CFA) is pleased to announce that the Traditional and Non-Traditional Grand Prize winners of the 2018 CFA Awards of Excellence in Franchising are Symposium Cafe and Little Kickers, respectively. The CFA awards two separate Grand Prizes in its annual awards program to reflect the range of franchise opportunities in the market. Considered the pinnacle of franchise achievement in Canada, the CFA Awards of Excellence in Franchising are given annually to franchise systems that have demonstrated the strongest, most mutually rewarding relationships with their franchisees. The Grand Prizes were presented during a gala awards presentation dinner at the 27th annual CFA National Convention in Ottawa, Ontario. Open exclusively to CFA-member franchise systems who have been franchising for three years or more, the CFA Awards of Excellence in Franchising recognize excellence in franchise operations. Winning systems must demonstrate a dedication to superior franchisee relations, leadership, business planning, marketing, training and support, ongoing operations and communications. This year, more than 70 CFA-member franchise systems participated in the competition, setting a new record. The winning franchise systems were decided based on the results of a survey completed by participating franchisors and their franchisees about their experiences and levels of satisfaction with the system. The CFA Awards of Excellence in Franchising is sponsored by the CFA and administered by the Portage Group, a third-party research firm. Entries were separated into Traditional Franchises (those with brick and mortar locations) and Non-Traditional Franchises (those that are mobile or home based). Within these categories, entrants were grouped based on number of franchisees. These categories reflect the wide range of franchise opportunities in today’s marketplace and create a more even playing field for the ranking of each entry. Gold: Triple O’s Silver: UCMAS Mental Math Schools Bronze (Tie): Speedpro Signs and Wendy’s Restaurants of Canada Inc.
Gold: Pizza Nova Silver: A&W Food Services of Canada Bronze: Boston Pizza International Inc.
Gold: Paul Davis Restoration Inc.
About the Canadian Franchise Association The Canadian Franchise Association (CFA) helps everyday Canadians realize the dream of building their own business through the power of franchising. CFA advocates on issues that impact this dream on behalf of more than 700 corporate members and over 40,000 franchisees from many of Canada’s best-known and emerging franchise brands. 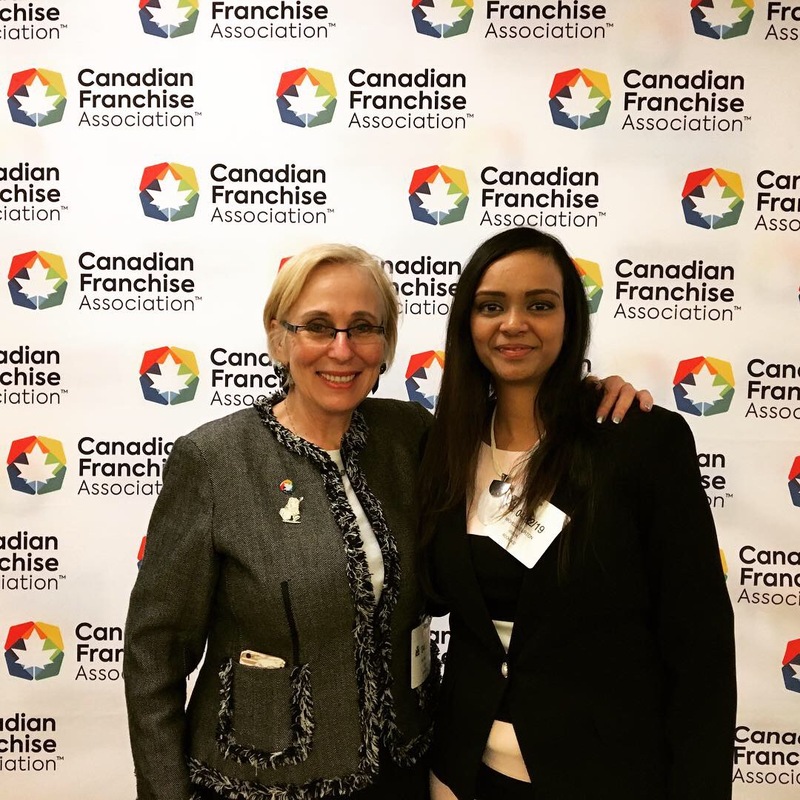 Beyond its role as the voice of the franchise industry, CFA strengthens and develops franchising by delivering best-practice education and creating rewarding connections between Canadians and the opportunities in franchising. Canadian franchises contribute over $96 billion per year to the Canadian economy and create jobs for more than 1.8 million Canadians. Learn more at www.cfa.ca or www.FranchiseCanada.online. 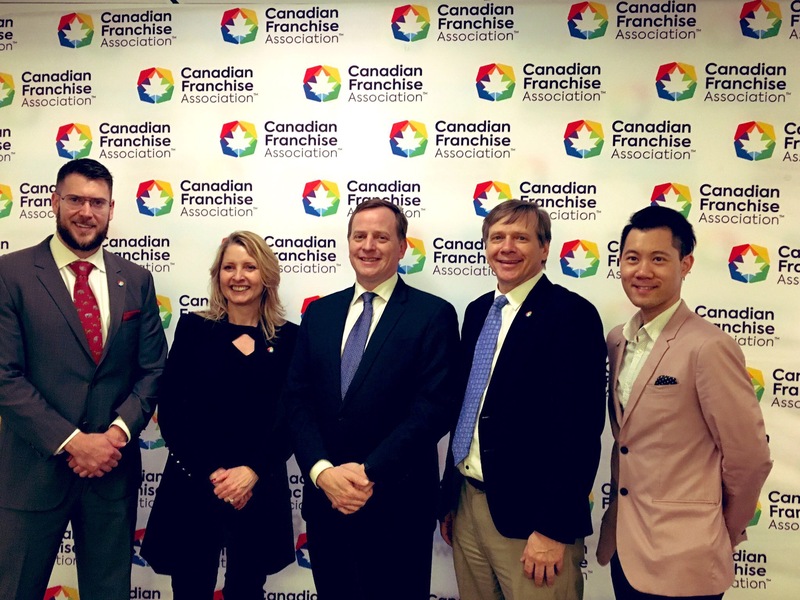 (Toronto, ON) April 25, 2018… The Canadian Franchise Association (CFA) (www.cfa.ca) announced the recipients of the 2018 Franchisees’ Choice Designation last night at a gala awards presentation during the 27th annual CFA National Convention in Ottawa, Ontario. This is the eighth year for the annual awards program and, to recognize franchise systems that have been awarded the Franchisees’ Choice Designation multiple years in a row, CFA has introduced special 5, 6, 7 and 8-year logos that these companies can use to promote their consistent high marks from franchisees. The Franchisees’ Choice designees are CFA member franchise systems who voluntarily took part in an independently-administered survey. Their franchisees were asked to rate the franchisor in key areas of the franchise business model, including leadership; business planning and marketing; training and support; ongoing operations; and the relationship between the franchisor and franchisee. In the due diligence process of investigating a franchise opportunity, speaking with existing franchisees about the opportunity being explored is essential. For prospective franchisees, the Franchisees’ Choice Designation identifies that a franchise brand has received solid endorsement and ratings from its franchisees. The 2018 Franchisees’ Choice designees are representative of the spectrum of franchise opportunities and the diversity and excellence of CFA members. Regardless of any awards or recognitions a franchise system may receive, CFA strongly recommends that prospective franchisees conduct thorough due diligence. CFA offers an array of products and events for prospective franchisees, including CFA’s official online franchise directory LookforaFranchise.ca, FranchiseCanada magazine, the annual FranchiseCanada Directory and The Franchise Show, Canada’s largest franchise-only exhibition held across Canada. For more information about the Franchisees’ Choice Designation program, visit www.awardsprogram.ca. (Toronto, ON) April 9, 2018… The Canadian Franchise Association (CFA) is pleased to announce the winners of the 2018 CFA Recognition Awards. The awards will be presented during a gala awards presentation dinner on Monday, April 23 at the 27th annual CFA National Convention in Ottawa, Ontario. CFA Recognition Awards pay tribute to individuals and franchise systems for their achievements and contributions to the Canadian franchise community, and for their commitment and contributions to philanthropic endeavours. Nominations are solicited from CFA members across Canada and winners are selected by committee based on merit. New this year, the CFA has introduced a Diversity and Inclusion Champion Award to recognize a company or individual for extraordinary leadership and contribution towards improving and promoting diversity and inclusion within their workplace and the franchise community in Canada. Since its launch in 1993, the Lunch Lady has had all the right ingredients for a rewarding franchise: serve good food to over 140 communities and help create diverse and inclusive societies. And it all boils down to founder Ruthie Burd’s dedication to ensure “everyone wins.” Today, she proudly supports healthier school food environments in hundreds of schools, delivering her service to thousands of kids, including those with allergies, helps schools raise much needed funds, and is currently involved in developing strategies to assist not-for-profit organizations to provide meals for those at-risk through the newly created Lunch Lady Foundation. Ruthie is also committed to providing employment opportunities for adults with special needs, not just in her company, but across Canada. What started out as a brand created by one mom for other moms, has grown into a thriving business that continues to serve communities in the best way possible. Trail-blazer. It’s the one word that best sums up Randy Moore and his achievements as President and CEO of Mister Transmission, a leading brand in driveline repairs. From a single store in Richmond Hill, Ontario in 1963, (where he was Store Manager), to more than 60 locations across the country, Randy Moore’s role in Mister Transmission’s growth is nothing short of exemplary. Through the span of his 40-year career, he’s gone above and beyond, mentoring franchisees across the automotive sector and forging one of Canada’s most iconic and memorable brands. With over 24,700 learning centres and 4.3 million enrolments to date, Kumon is one of the fastest growing businesses, helping children achieve their academic potential worldwide. But back in 1954, founder Toru Kumon was only intent on helping one child achieve his potential: his son. After coming home with poor test results, Kumon created math worksheets for his son’s daily practice. Fast forward to 2018 and children all over world use Kumon’s math sheets as a springboard to success. Through an unwavering commitment, the Kumon brand continues to ensure every child is able to reach their academic goals through partnerships with organizations like the Japan Integration Cooperation Agency and Bangladesh Rural Advancement Committee. Walking the walk, BioPed is more than just a brand specializing in custom orthotics. It’s a brand that’s helped underprivileged communities around the world move safely, easily and comfortably through its Goodytwoshoes Foundation. Partnering with charities like Salvation Army Shelters since 2010 and Soles4Soles more recently, BioPed has kept shoes out of landfills and provided footwear to people in need. From children walking to school to receive an education to women working out on fields to feed their families, BioPed remains dedicated to providing the foundation for happy and healthy communities everywhere. With potential changes to Ontario’s labour laws posing a critical threat to franchising in the province, the CFA’s ability to advocate for franchisors and franchisees on this issue would not have been possible without the dedicated volunteers who made up the CFA Changing Workplaces Task Force. Formed in November 2015, the Task Force worked tirelessly to ensure that the government did not adopt recommendations for a joint-employer designation for franchisors, which would have destroyed the franchise business model in Canada. As a result of these efforts, joint-employer was not included in Ontario’s new labour legislation, and franchisors were not singled out in any of the amendments. 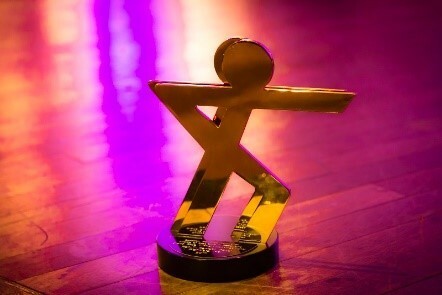 For more information about the CFA Recognition Awards, please visit: www.cfa.ca. The CFA’s Golf Tournaments are back, and bigger and better than ever before! 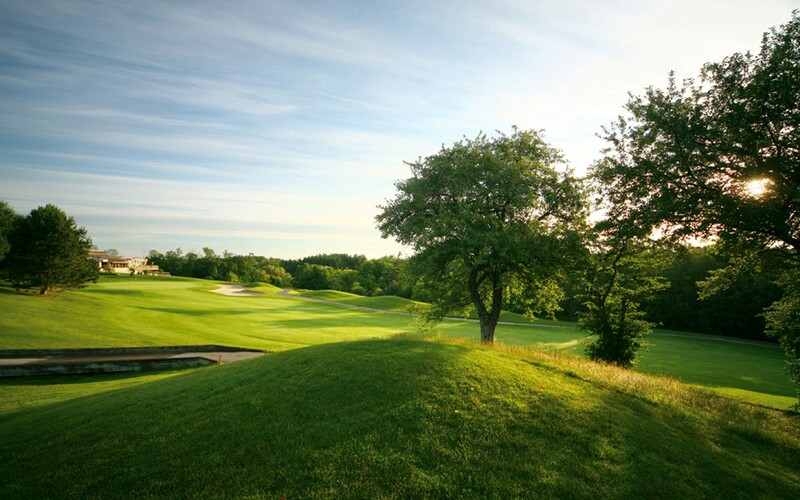 Join us this June for one of three golf classics in British Columbia, Ontario, and New Brunswick. 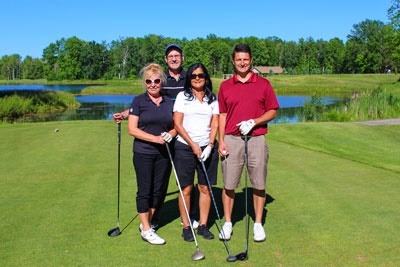 Exclusive to CFA-member and non-member franchisors and industry suppliers, each golf classic is designed to optimize your chances of making substantial business connections, connect with colleagues and industry leaders, and discover new ways to enhance the franchise business model. All proceeds will go towards CFA’s advocacy efforts, which includes leading the fight against legislation that prohibits franchise systems from effectively executing their businesses, while simultaneously promoting excellence in Canadian franchising. Golf competitions will be held throughout the day* in addition to the main 18-hole tournament where you and your team can compete to win the CFA’s Golf Cup and be fitted for Blue Jackets. Registration for all three tournaments includes: green fees, a shared power cart, lunch, reception, and dinner. Get Ready for the Biggest Event in Canadian Franchising! Click here to see who’s attending the 2018 CFA National Convention – it’s a who’s who of franchising! Canada’s biggest franchise conference is just around the corner! 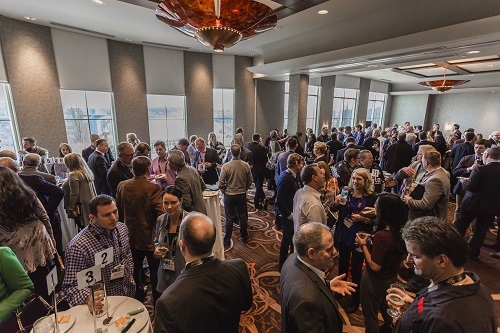 Taking place April 22-24 in Ottawa, Ontario, the Canadian Franchise Association (CFA) National Convention is the best place to network with the industry’s top executives and create influential business connections with esteemed franchise leaders. Click here to see who will be attending this year’s conference! – Hadi Chahin, Mary Brown’s Inc.
Don’t miss out on all of the excitement! Click here for full details about this year’s education and social program and register today. (Toronto, ON) March 28, 2018… Century 21 Founder U. Gary Charlwood and Nurse Next Door Co-Founder John DeHart – two of Canada’s greatest business success stories – are among the experts who will address franchise business leaders during the 27th annual Canadian Franchise Association (CFA) National Convention, to be held from April 22 to 24 at the Westin Ottawa. 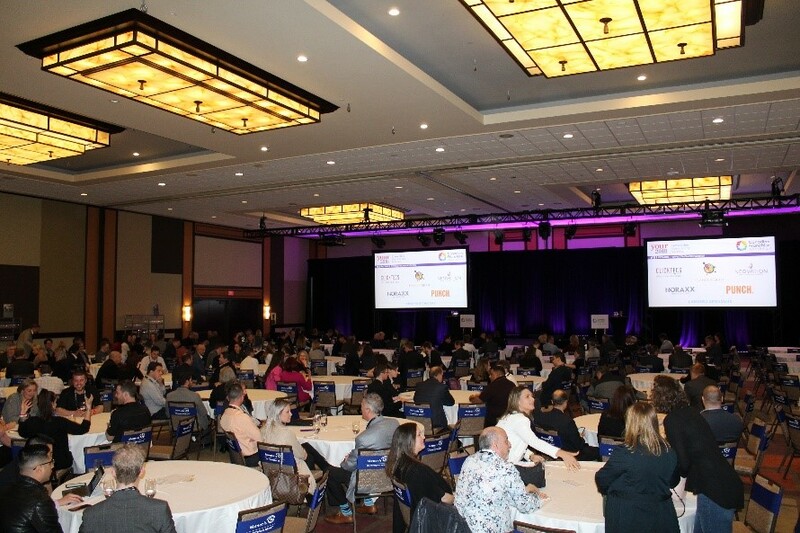 More than 500 franchisors are expected to attend this year, representing Canada’s leading brands including McDonald’s Restaurants of Canada, PropertyGuys.com, Dairy Queen, Boston Pizza, Kumon Canada, Mister Transmission, and A&W Food Services of Canada. Gary Charlwood, Founder, Charlwood Pacific Group, will share his inspiring journey from an employee struggling to make ends meet, to an international franchising trailblazer. In addition to learning and networking, attendees will also celebrate their peers at the much anticipated Gala Awards Presentation on Monday, April 23, where the CFA will announce the winners of the Awards of Excellence in Franchising, Franchisees’ Choice Designation and Recognition Awards. These highly coveted awards celebrate excellence in franchising and the mutually-rewarding relationship between a franchise system and its franchisees. For more information about the 27th annual CFA National Convention, visit www.cfa.ca/convention. Most people would consider it a fairly long – and risky – leap to move from the fast-paced high-tech scene to the more sedate, conservative field of health care services. Not John DeHart – he paid no heed to the risks, and jumped right in. After making his mark as an entrepreneur in the heady New York tech scene in the ‘90s, helping launch five tech companies as a venture capitalist, DeHart did some soul searching and decided the tech world was not for him. While it was fast and fun, the industry lacked the “heart and soul” the young Cornell business grad was looking for. That spelled opportunity for the two, who decided to launch a business to fill what they saw as a vacuum in the marketplace. Their goal was to put their finely-honed business sense to use by building a completely different, aspirational health care model that would deliver more than just run-of-the-mill home care. That model was Nurse Next Door, which launched in 2001, and is continuing to grow in leaps and bounds. At Nurse Next Door, the focus is on happier aging rather than just churning out a set of practical services. While the services are obviously provided, this is done within the framework of bringing happiness to the day-to-day lives of the company’s senior customers. A question asked of every client is: “What’s the one thing you love to do that you can no longer do?” Caregivers then try to help clients rediscover lost activities and interests. The idea of reinventing the wheel was not always welcomed in a sector that’s steeped in tradition and slow to change. More than one industry insider questioned DeHart’s modern take on health care, all the way down to the bright bubble-gum pink branding of the company cars. The concept has worked extraordinarily well for the duo. Six years into their business, they started franchising, and today, Nurse Next Door has grown into a 150-franchise operation with locations across Canada and the United States. Plans are in place for 50 more locations this calendar year, and another 50 the next, and the company is also eyeing international markets like China, Australia, and the United Kingdom. The company is perfectly positioned to benefit from the “Silver Tsunami” hitting western societies, as Baby Boomers retire en masse and cope with the challenges that come with aging. This brings us to DeHart’s newest business venture, LIVE WELL Exercise Clinic. Dubbed the “anti-gym,” LIVE WELL is a medical fitness clinic that targets sedentary people who suffer from chronic diseases, most notably diabetes, obesity, and heart disease. Far more than a regular workout gym, LIVE WELL aims to teach people the skills to build healthy habits, and get them moving through supervised, customized exercise programs. DeHart tapped into the idea of “medical fitness” a few years back in, of all places, his office elevator. There was a LIVE WELL location in the same building, and he regularly bumped into gym members singing the praises of the life-changing program as he rode up the elevator. 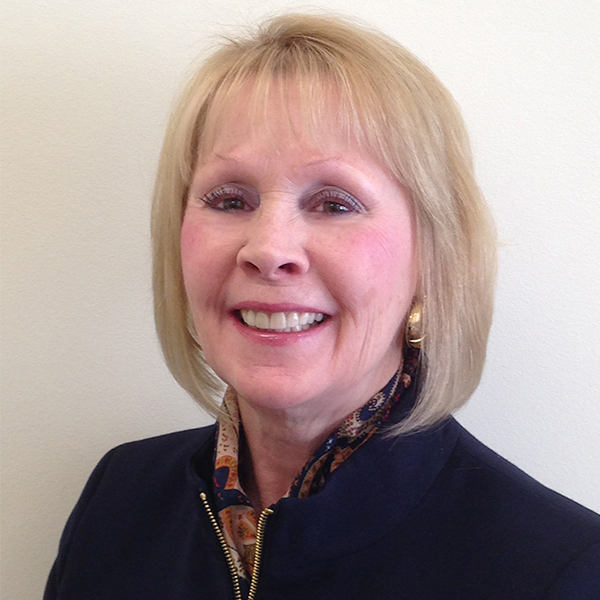 Nurse Next Door had hired Cathy Thorpe as CEO the previous year, leaving DeHart to focus on his newest venture. In the fall of 2016, he and Hodson opened the first three LIVE WELL franchises, all on B.C.’s Lower Mainland. There are plans to bring that number up to 15 by the end of this year, and to move into Calgary, Edmonton, and Toronto with another 15 openings in 2018. 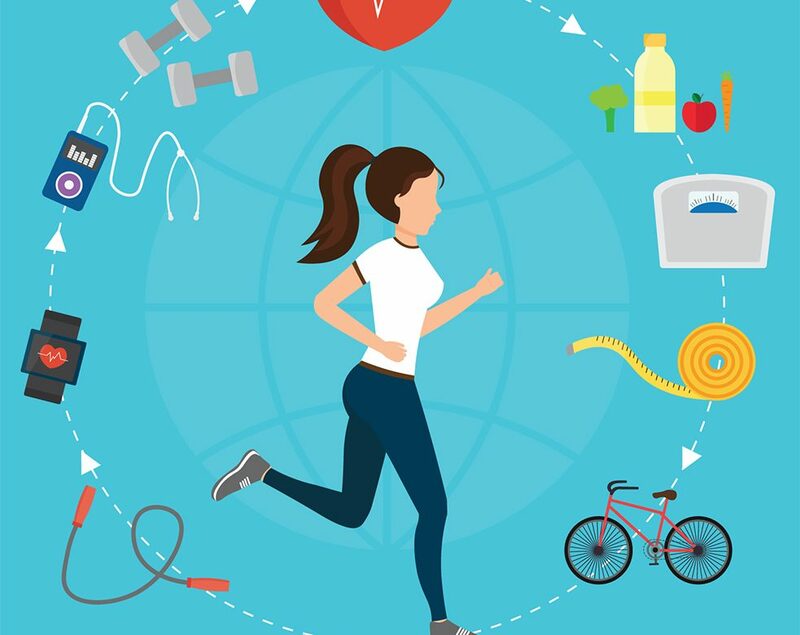 Extensive training is provided for both brands, and while health care experience isn’t necessary, there does need to be a registered nurse on staff managing clients at Nurse Next Door and a clinical exercise physiologist to oversee the exercise programs at LIVE WELL. If a franchisee has one of these skill sets, he or she can fulfill this role; otherwise, a person with the necessary expertise is hired. The starting investment for Nurse Next Door is around $150,000, and the business can be run from home to start. Around $300,000 is required for a LIVE WELL franchise, which requires a bricks-and-mortar location. DeHart is sanguine about his future as he branches into his second health care venture, and is exhilarated at the prospect of building another strong national brand. But to him, it’s about far more than just business success; it’s about helping others live their optimal life. In other words, it’s a business with the “heart and soul” he was once yearning for as a young man. To hear more of DeHart’s inspiring success story, attend his Keynote Presentation at CFA National Convention and learn how to optimize your chances for franchise success too. Register now! With a focus on franchise systems catering to customers on the go, the March/April issue of FranchiseCanada is guaranteed to be a hit among entrepreneurs interested in joining a popular and growing industry! Our annual Quick Service Restaurants (QSR) issue is now available online, as well as on newsstands and in bookstores across Canada, and in Air Canada Maple Leaf Lounges across the globe. A perfect read for future small business owners eager to invest in a fast-paced environment, this issue will feature the top QSR franchises providing customers exemplary service, convenience, and value and will give readers an inside look at the success of one of Canada’s oldest and most iconic and beloved QSR brands! Women of the Franchising World: As the world celebrates International Women’s Day on March 8, FranchiseCanada features four females in franchising as they discuss their challenges and successes as small business owners. Fresh and Flavourful: If you’re a foodie at heart, our feature on Asian cuisine across Canada is sure to get your mouth watering. From Edo Japan to Bento Sushi, our Fresh and Flavourful feature is giving readers all the pertinent information they need to invest in this popular food sector. 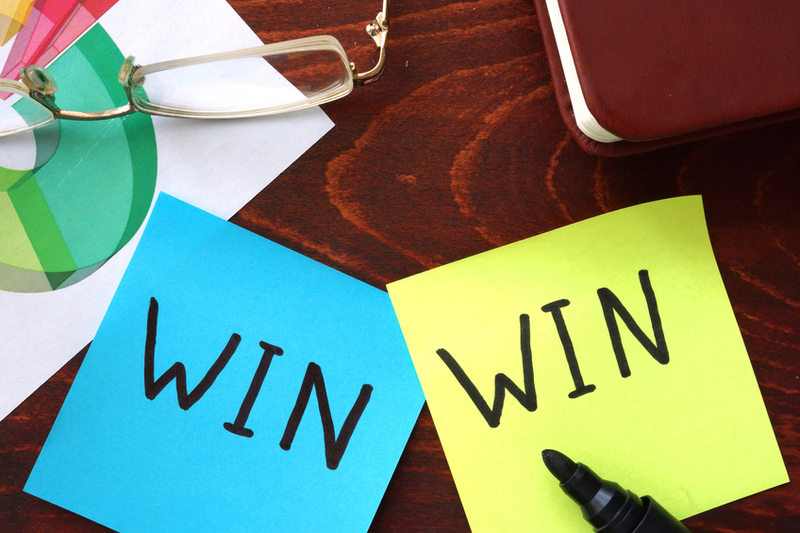 Succeed as a Franchisee: Do you have what it takes to succeed as a franchisee? In this feature, we give you 10 traits all best-in-class franchisees have in common and detail how you can use these qualities to create your own success. 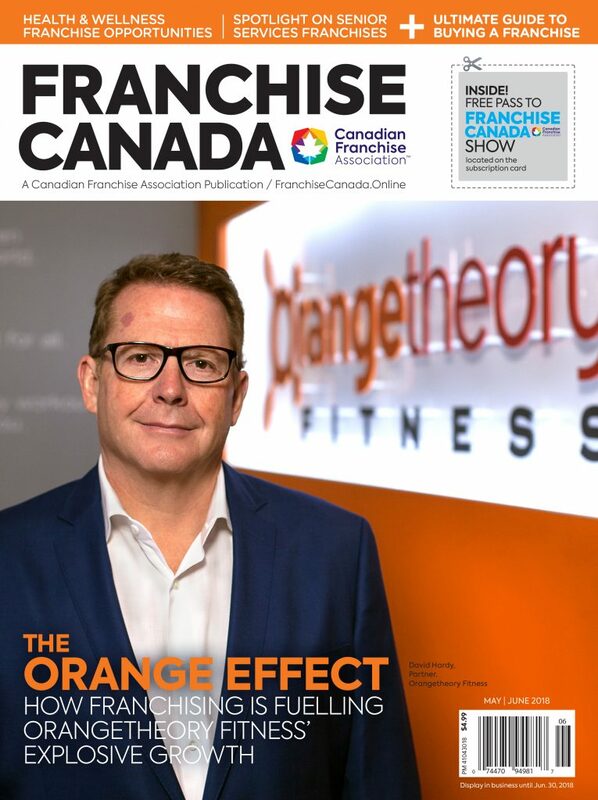 Plus, be sure to check out the editorial found in every issue of FranchiseCanada featuring franchisees and franchisors that have made a strong impact on the franchise community. Visit FranchiseCanada Magazine online to read article from the March/April 2018 issue for free and get more information about franchises that are expanding in your area. You can also check out the print edition on newsstands, order your subscription online or call 1-800-665-4232 ext. 240.